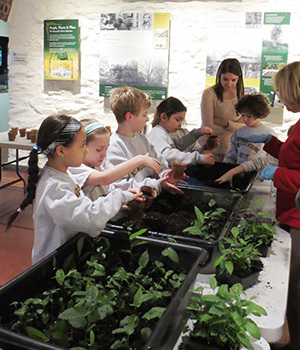 Partners in Education is a dynamic collaboration between the Morris Arboretum and schools in the Philadelphia region. Begun in 2008, this program is designed to promote, in K-12 grade students, a greater appreciation and understanding of the environment through on-going visits to the Arboretum. 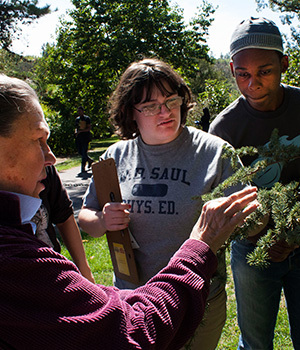 Teachers and students are encouraged to think of the Arboretum as an outdoor extension of their classrooms – enriching the curriculum and enhancing students’ environmental consciousness. Morris Arboretum hosted 10th, 11th & 12th graders from Saul Agricultural, Mercy Vocational, Lankenau and Carver Engineering and Science high schools. 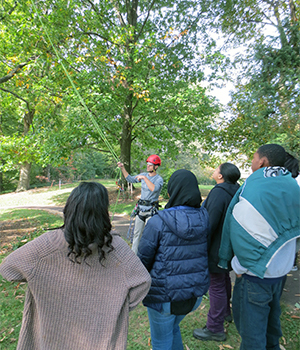 After taking part in roundtable discussions with area professionals, students learned about tree climbing and the sustainable features at Bloomfield Farm from Arboretum staff. Curtis Helm from Philadelphia Parks & Rec presented soil sampling in the wetland area, and for the first time a session on “soft skills,” including resume writing and interviewing, was presented by Sidney and Nia Toombs from Allied Barton. Norwood-Fontbonne Academy students enjoy the Arboretum several times a year for both guided and self-guided tours and programs. Students pictured are participating in the annual Arbor Week program at the Arboretum, and take home their very own tree seedling to tend. Mercy Vocational High School brings their tenth grade Biology Classes to the Arboretum every year. 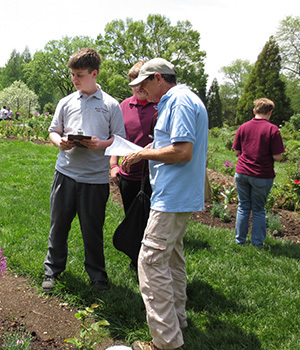 Pictured here in the Rose Garden, students examine plant characteristics. In the Fall, eleventh grade students complete independent journaling activities through the gardens. WCS, is an Environmentally focused Charter School in Philadelphia. Students from multiple grades visit the Arboretum in every season. 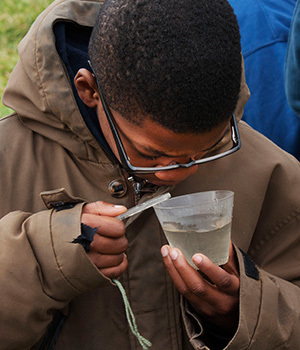 Wissahickon Charter students have explored the natural areas of the Arboretum with experienced guides, and discover the consequences of loss of wetland habitat. 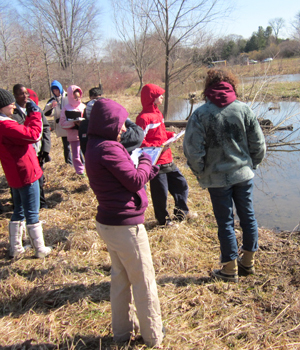 Morris Arboretum’s USDA Forest Service liaison, Sarah Low, leads bi-monthly walks with PSD sixth and seventh grade students to observe how the Arboretum’s wetland changes throughout the year. During these visits, students study the bark of various trees in winter, observe migratory birds in the spring, and explore a vibrant natural area that is alive with plants and wildlife all year long.